One bright morning in late July I decided to climb to the top of the Graigellachie, that precipitous spur of the Monadhliaths standing like a rampart behind Aviemore, and explore the surroundings of a mountain tarn and its associated bog-land, situated in a depression beyond the summit. The day was warm and sunny, with a gentle wind that whispered softly through the trembling Birches that clothed the craggy and scree encumbered slopes of this great grey pile. I climbed up to the barren plateau that forms the summit of Craigellachie where the green carpets of the Bearberry covered the grey slabs of stone which were separated by patches of black bog. From here a magnificent view presented itself as one looked out across the wide expanse of Speyside towards the Cairngorms. Below lay the great black mass of Rothiemurchus Forest through which the Spey wound like a silver serpent, while beyond the lochs lay like diamonds amid the blackness of the Pines. And beyond all, like a great wall stretched the deeply cut massif on the Cairngorms. From here Cairngorm, Ben Macdhui, Braeriach and Cairn Toul were plainly visible and the deep glens of the Lairig Ghru, Glen Einich and Glen Feshie were easily discernible. It was a scene of indescribable beauty bathed in sunshine, an ever-changing kaleidoscope of colour, the purple moors, the black forest of pines, the brown mountain sides, the silver lochs and green pastures forming a perfect symphony in colour. Leaving this beautiful picture, I descended 100 feet through the heather toward the little tar, lying behind Craigellachie. Around its edges grew small mountain willows, for the rest the heather and needle whin were the chief vegetation. Along the lower edge of the loch lay a large patch of mossy bog, yellow with the Bog Asphodel Moving cautiously I flushed a curlew who had been busy searching in the mud along the shore and flew off with a mournful cry as if the spirit of the loch had taken flight at my approach. The bog was a little floral garden, where I found the beautiful innocent blooms of the Cloudberry, the fragrant Bog Myrtle, the purple Butterwort and the Round-leaved Sundew and its long-leaved relative along with numerous sedges and bog grasses. Here I spent a delightful day alone with the sun, the gentle breeze and the sparkling mountain air filled with the honeyed perfume of the heather. I studied the divers inhabitants of this interesting spot, and especially the insectivorous plants. It will come as a surprise to many people to know that in the plant world there are certain plants which trap and digest insects, in much same way as a spider catches a fly and eats it. We are so used to the insect visiting glower to steal their pollen and nectar, but that plants should actually live on an insect diet is almost unbelievable. The plant I am about to describe are some of the most interesting in the world and have been the sourced of much speculation and research since Darwin’s classical experiments with them. In the bogs we can find two types of insectivorous plants occur, such as the Bladderworts, but I shall describe them in another chapter as they are actually aquatic plants. In Britain we have three Sundews. They are the Round-leaved Sundew (Drosera rotund folia), which is the common species; the Long-leaved Sundew (D. long folia) and the English Sundew (D. anglica) are frequent although less common than the first one. All three species are found in the Highlands in bogs from sea-level up to 2,000 or 3,000 feet. They are among the strangest plants to be found in Britain, for they have reversed the order of Nature and, like carnivorous animals, trap and digest flesh in the form of small insects such as flies and mosquitoes. The three species are very similar and close study of D. rotundifolia will apply equally to the other two. If we examine a single plant we shall find that it has a very small, weak root system which is very small in proportion to the plant that it is supposed to nourish. The rootstock is crowned by a rosette of almost round leaves on long slender stalks, which are covered by long, reddish glandular hairs. The upper surface of the leaf is also covered by many red hairs, each with a glistening drop at its extremity which shines like a jewel in bright sunshine. The leaves are quite different from those we are usually accustomed to in the plant world, and one may be well at a loss to understand their purpose. If we examine a number of these plants we shall find that a fly or gnat, attracted by the glistening drops, alights upon the leaf and commences to the lick the drop. Immediately we shall notice that the hairs nearest to the insect move down and touch it, and then the hairs further away begin to move also. The fly struggles to escape, but the honey-like drops that tempted it are stickier than glue and it cannot move. Its struggles excite the rest of the hairs which, exuding more and more sticky fluid, enclose the fly like the tentacles of an octopus. They move under the same principle that makes the tendrils of a clematis twine around a support. Gradually the breathing pores of the insect are choked by the sticky fluid and death arrives to still its sufferings. When the leaf has completely closed around the insect, special glands upon the surface exude a fluid which is exactly similar to the gastric juices of the stomach of an animal. The insect is slowly digested, the juices entering the leaf by specialized glands. As soon as the fly is completely digested the leaf opens again, ejects the indigestible portion such as wings and is ready for the next victim. Thus the fly actually nourishes the plant. Darwin made an exhaustive study of these plants feeding them artificially with raw meat. He gave them indigestion by over-feeding them and poisoned them with poisonous objects. He found that inanimate things such as leaves, dirt or wood excited the nearest hairs which closed round the object only to unfold when they found that the object was not fit to eat. In nature this must often happen as the wind blows particles of sand, et., on to the sticky hairs, but by this amazing selective capacity no vital juice is wasted upon these useless substances. One will probably ask why it is that the Sundew has evolved this amazing way of life. The reason is not difficult to find. As we have already shown, the soil of the bogs is poor in certain vital elements, the chief of which is nitrogen. Now this element is of great importance to the well-being of plants and a certain quantity is necessary for healthy growth. Animal life is rich in nitrogen and the flies and insects trapped by these plants supply the nitrogen that is deficient in the soil. 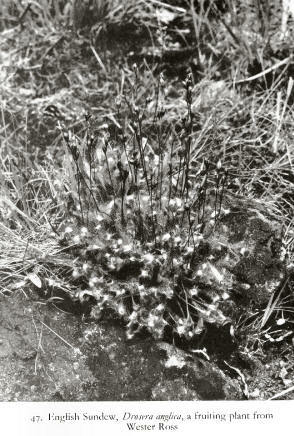 The flowers of the Sundew are small and white and arranged in a raceme at the summit of a very fine flower stalk. The raceme is rolled up in a curve when young, but gradually uncurves as the flowers expand. The flowers have a tiny calyx of five green sepals, within which are found the five rather long petals which only open in sunshine. They are fertilized by small bees and flies. 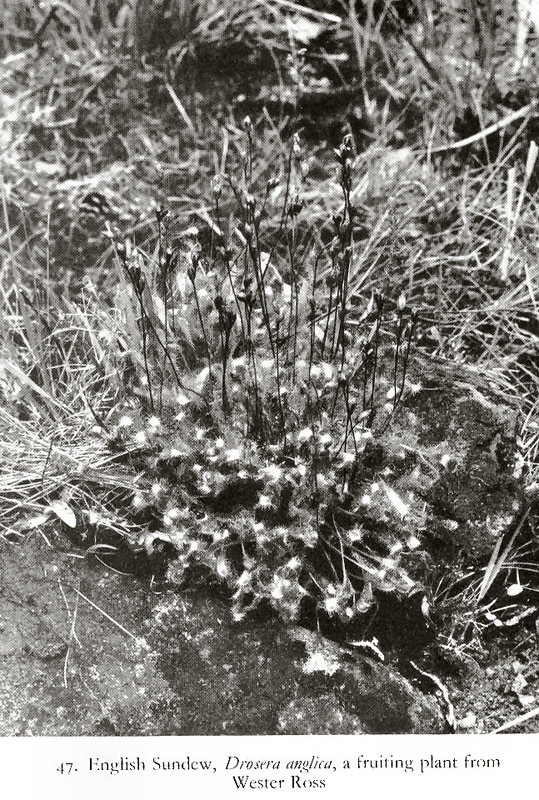 The Long-leaved Sundew is distinguished from the preceding by the leaves being more erect and long and narrow, gradually tapering into the stalk. It is a less common plant than the former, although often found with it. The English Sundew is much like the long-leaved species, but the leaves are longer and narrower, often over one inch long without the stalk, and the flowers are rather larger than in either of the preceding species. In Britain we have four species of Butterworts, of which three are found in the Highlands, one species, the Alpine Butterwort, not being found beyond the limits of the western Highlands. 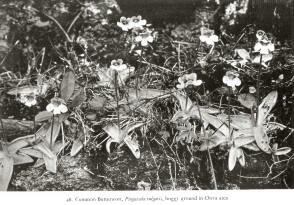 The three species are found in similar situations to the Sundews and include the Common Butterwort (Pinguicula vulgaris), a very common species throughout the Highlands from sea-level to 2,500 feet or more; the Pale Butterwort (P. Lusitanica), a small species confined to the western Highlands although found elsewhere in Britain, and the Alpine Butterwort (P. alpina), found only in Skye, Ross and Sutherland. As in the case of the Sundews a detailed description of P. vulgaris will suffice for the other two species. The Common Butterwort belongs to the Lentibulariaceae, a family composed of insectivorous plants, including the Bladderworts. The leaves, which are broad, rounded, rather succulent and arranged in a close rosette, are of a light grayish-green colour and are covered with numerous crystalline points which give them a wet and clammy appearance. The leaves are very interesting and well worth a close examination, the upper surface being covered in a sticky fluid which is secreted by certain specialized glands and is the medium by which the insects are trapped. If the surface of the leaf is scrutinized under a powerful lens one will find that there are numerous glands scattered over it, some with stalks and some without. Several thousands of these glands have been counted upon a single leaf. They supply the digestive juices and the sticky fluid, which shines in the sunlight and attracts insects who arrive in the hope of finding nectar. As soon as they alight upon the treacherous surface they are trapped. The glands then supply a ferment which gradually reduces the insect to a liquid, only the hard portions, such as wings and legs, being left. Very often the leaves curl up to form an improvised stomach. Other glands absorb the liquid as it is formed. In this way the plant obtains foodstuff which is absent from the poor, acid soil. The undigested portions remain upon the leaves until they are washed away by the rain, and the trap is then rest for fresh victims. The flower of the Butterwort is very handsome and of a deep purplish-blue, and terminates a tall leafless stalk. The calyx, like that of the Snapdragon, is lipped and consists of five segments. The corolla is also lipped and is situated at right angles to the stalk, the lower lip consisting of three broad lobes, the upper of two shorter segments. The throat of the corolla is bell-shaped and is extended backwards to form a long, straight spur at the base of which are situated the nectarines. Two stamens are situated near the roof of the throat while the stigma projects towards the entrance. An insect alighting upon the lower lip must touch the projecting stigma with its head and thus covers it with pollen. The stigma immediately springs up so that when the insect withdraws its head it will not deposit any pollen from the flower’s own stamens upon it, and thus self-fertilization is avoided. Butterflies and bumble-bees are the chief visitors as their tongues alone are long enough to reach the nectarines at the base of the long spur. The Alpine Butterwort is very similar, but rather smaller in all its parts, the flowers being of a pale yellow colour and having a very short obtuse spur, whilst the middle lobe of the lower lip is long and broad. Its insect visitors, as the short spur indicates, are short tongued and include hone-bees and flies. The third species, the Pale Butterwort, is much smaller than the Common Butterwort. The leaves are very similar, but the flowers, which are smaller than those of the Alpine Butterwort, are pale yellow in colour, tinged with lilac, and have very slender stalks, whilst the spur is short and slightly curved. Honey-bees and small butterflies are the chief benefactors.